The Cemetery is open to the public on the Third Saturday of every month. It is free of charge, but we survive on donations, so please be generous! Visitors can wander around or a self-guided tour, hitting the highlights on the map that we provide, or they can go with a docent-led tour, which is also free. The tours take between 20 minutes and an hour, depending on the docent and the level of interest...but you can come and go as you want. Generally, tours are offered every hour on the hour, but if you're interested in a tour, just ask at the gate. Private tours at other times are possible, and require two weeks notice. A donation is requested. You may call us to make a reservation and indicate any special interests. For example, are you a descendant who would like to see ancestor's headstones? Are you interested in one of the many national and ethnic groups buried at the cemetery? Are you looking for a particular historical figure? You can reach us best by email (board@tolomatocemetery.com) or by texting us or calling us at (904) 257-3273. Group tours on other days of the week may also be arranged. Commercial tours are not permitted and all tours must be arranged at least two weeks in advance so that we can arrange for the docents or other support that your group might need. 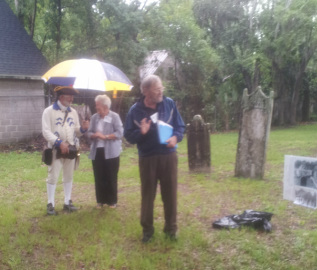 Dedicated docents Nick McAuliffe and Louise Kennedy giving a talk in the rain, with 18th century soldier John Cipriani standing by.